This post was sponsored by Luna Comfort's B.R.E.W. Crew. All opinions below are original and mine alone. Momma Told Me: And everyone would gather round the water cooler. Before I existed, Momma worked a 9-5 office job assisting with copy-writing for a marketing firm. I wasn't around, but I hear many stories, growing up, of how her and her office-mates would gather round the water cooler and dish about the latest gossip and what was on the television the night before. I never really quite understood the magical effects of this simple appliance, but I knew, someday, I wanted a water cooler of my own. Of course, the water dispensers of my time are a bit more advanced then those quick draining cabinets of Momma's work years. They are also becoming increasingly popular inside consumer homes. Whether you're considering a water cooler to simply offset the cost of filter pitchers and individual bottles, or have a high traffic area in your home where it's required, there are several things to consider. My first suggestion is to buy a water cooler outright from a manufacturing company, such as NewAir, that does not have a stake in which water you use, or how long you own the appliance. Buying an affordable model, such as the WCD-210BK NewAir water dispenser will allow you to choose your bottles sizes (2, 3, or 5 gallon) and refill at your own convenience through delivery or a refill station. While all water dispenser makes and models might seem identical at face value, small thoughtful features, such as the WCD-210BKs 'Spike Seal Puncture' means you can easily install a sealed water bottle without the worry of water overflow and spills. Many modern models still require you to remove the water bottle's wax-like seal and quickly turn the heavy bottle upside down, as installing. This particular unit also has the benefit of hot or cold dispensing with a temperature range of 41F - 201F; which can turn your water cooler into a hot water dispenser during those blustery Fall and Winter months. You will also want to consider the materials your water cooler is made of; as plastic water basins can sometimes add an aftertaste to dispensed water. This particular unit has a thoughtful stainless steel drum which not only keeps the unit operating more efficiently, but eliminates aftertastes and added plastic flavors. Many first time water cooler buyers worry about the convenience of the system setup, and consequential continued operation. Back in my childhood there were two primary methods of refilling your water cooler; a costly delivery (to your door) service, or hauling the empty jog down to a spout-fill station. These days there are affordable and eco-friendly options, such as branded refill stations where you can receive a recycling credit for used bottles, refill owned bottles, or buy an entirely new filled and sealed bottle. 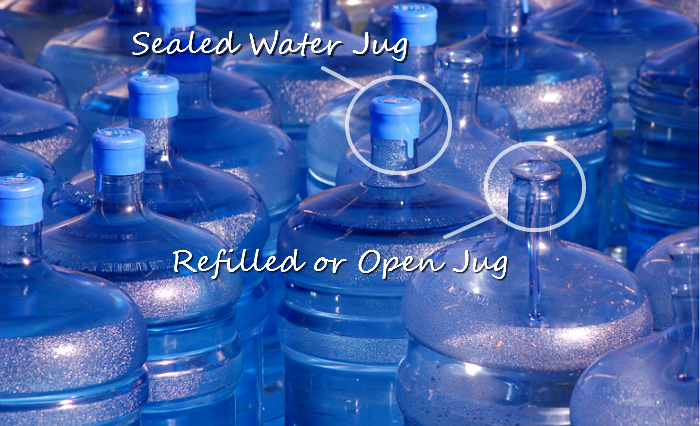 Naturally, how you choose to keep your water dispenser full will be determined by how often you drain your jugs, and if you have a water brand preference. 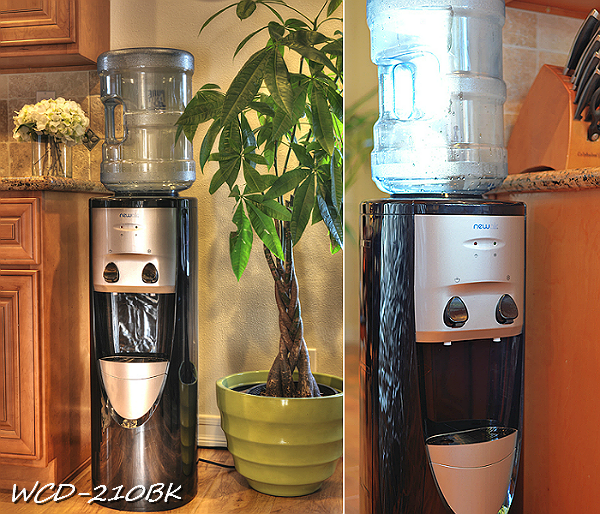 When it comes to setting up your brand new water dispenser; don't be intimidated. NewAir offers a wide range of water coolers direct to your door. The WCD-210BK requires little to no initial setup. Simply be mindful not to place the unit in direct sunlight, and ensure that it is stored on a flat, stable, surface. You'll spend more time deciding whether to put it in the garage or rec room! What Daughter Says: Create a hub everyone will buzz around in your home, with an in-home water dispenser. I need one of these! I keep trying to convince my husband! I would use it all the time! I always worry here about water because if our power goes out we also lose our water because we are on a well. And the power goes out rather frequently. I'll have to show this to the hubby. Thanks! I would so love to have this. It would be awesome for the kids. I've often thought about getting a water cooler. Maybe having one in sight would help me with my water consumption. That'd be awesome to have...my husband is very picky about his water though. I wonder if this would get my kids to drink more. I think they run around too dehydrated. I know it would help me drink more. We need one of those! We go through tons of water in our house. Such a great cooler! We drink A LOT of water and spend a lot on filters. I know having a cooler would save us some money! That is one sleek water cooler. I wonder if we would drink more water if we had one of those in the house. This would be awesome to have in my home! I love the modern look it has. We have water delivery and have a cooler. This sounds like a great cooler! Boy do we ever need one of those. Our city water is very hard and tastes horrible. 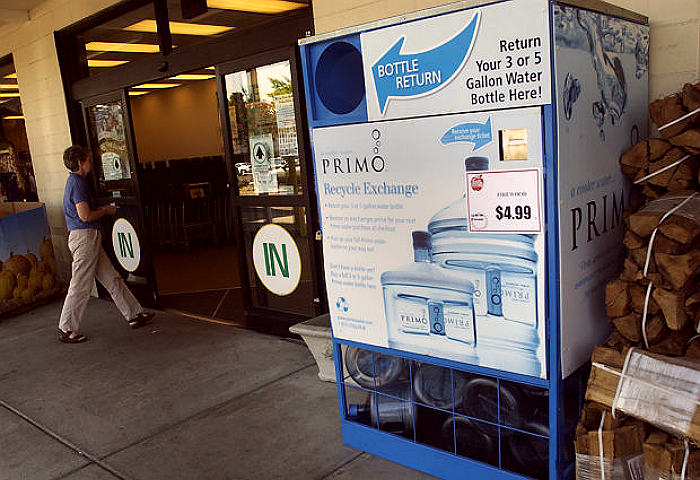 We spend SO much money on individual bottled water it's not even funny. Love the stainless steel drum feature - I never thought about how the plastic could affect the taste but you're right! That is one sleek looking water cooler, wow! Love how it adds some sparkle to your kitchen! 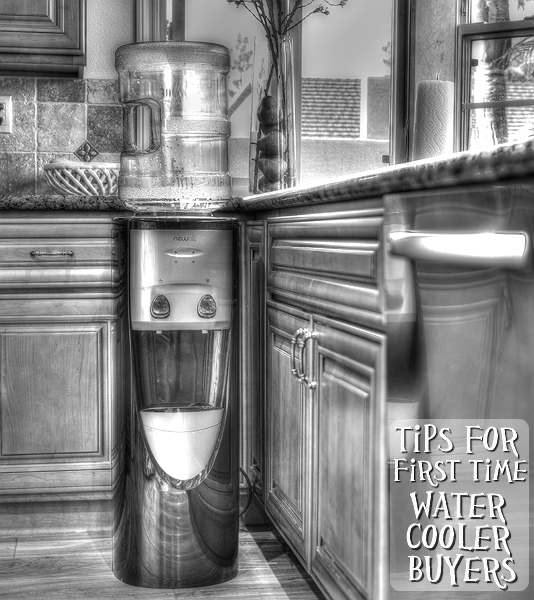 I have always considered how nice it would be to have a water cooler right in the house, and after reading your post I am much more confident in wanting to invest in one now that I've seen your post. Glad the installation was easy for you, too! That's one sharp looking water cooler. I love the look of it. The stainless steel is really nice. I love this water cooler. My last water cooler was an ugly, white thing. It was totally out of place in my house. This stainless steel number is great! This looks very convenient and the kids could get it themselves without any worries. Great idea. This is SO futuristic and cool! If I had one in my home, I bet my kids would drink a LOT more water. Those are fabulous tips and so very helpful. We love our water cooler and couldn't live without it. I should get one of these. I am always drinking water. It would be so helpful. That really is a nice perk that you don't have to remove the seal. I'd drink more water if I had this contraption in the house too. I think I would drink more water if I had a cooler like this. What a great use of water as well if the power went out! we use to have a water cooler like this when we lived in DC because the water was awful! I would love to have a water cooler in our house! I would drink so much more! This water dispenser would go perfect in my kitchen. I could do without all those water bottles too! I have never seen a cooler looking water cooler! Very sllek & modren! I would love a fancy water colour like that! My kids and I would use it all the time. I hate tap water. We do something like this right now, but the water is delivered to our house. I like the look of your water cooler. I drink so much water that I would love a water bubbler in our house. Would save me so much money too! Man, the way my kids drink water, I could really use this!! I am thinking of getting one! In this post every detail is useful and effective. It is my pleasure to be here. Thanks for share with us.